This is the second week in a row that I've had a Famous Fridays post featuring a cookie from a new cookie cookbook (last week it was this). I guess you could say I'm a little cookie obsessed right now. 'Tis the season! While I love both books, I think this one may be a better choice for the baker who likes to understand the science behind the baking magic. The recipes are very detailed in terms of directions, explaining just why it's important to use both baking powder and baking soda and other interesting factoids regarding your favorite cookies. This cookie book also has a wider, more comprehensive range of cookie recipes and a whole section on what brands of kitchen supplies work best. But you really can't go wrong with either book--I want them both!! And now on to the making of this cookie, which is really super simple--no electric mixer necessary. In fact, the whole thing gets mixed in a large saucepan! The key to their wondrousness is the browning of the butter and the way it combines with the generous amount of dark brown sugar. Butterscotch, toffee and caramel all wrapped up in one tender little disc! 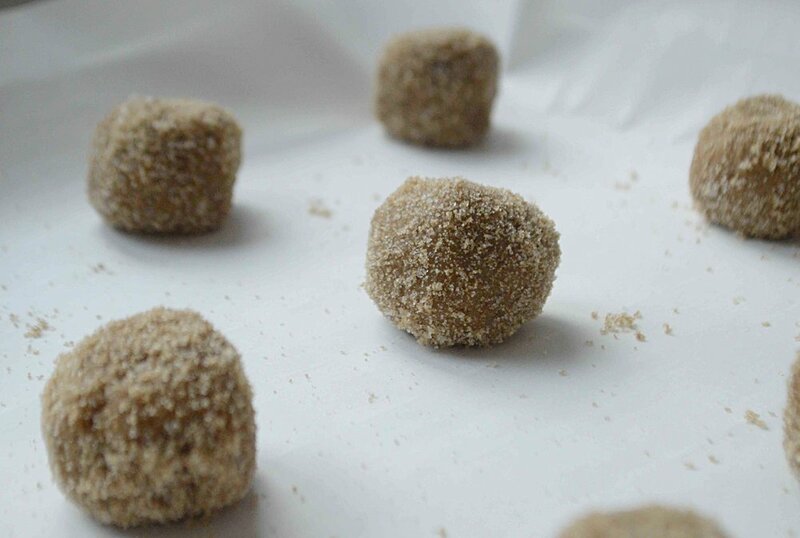 Right before you're ready to bake, you roll the balls in a mixture of ordinary granulated sugar and dark brown sugar, which means that there's brown sugar both in and on top of the cookies. Yum! Crunchy on top and chewy through and through, these are a real crowd pleaser and even though there is not a speck of chocolate in sight, these have found a special place in my cookie-loving heart and I know I will be making them for years and years to come! One bite and you will be too! Meanwhile, if you're looking for a gift for your favorite baker pick up a copy of The Perfect Cookie, I know I would LOVE it (hint, hint) and have a fun, tasty and safe weekend. See ya next week with more great holiday favorites!! 1. In a large skillet (preferably high-sided to catch the splatters) melt 10 tablespoons butter over medium-high heat. Swirl occasionally, allowing butter to turn dark golden brown with a nutty aroma. This should take anywhere from 2-3 minutes and you should see little speckly solids in the bottom of the pan. Add in the remaining 4 tablespoons butter and stir until melted. You can either now transfer to a large bowl or leave in the pan if it's a high-sided one (I left it in the pan and it worked really well for me.) Either way, let the butter sit for 15 minutes to cool. 2. Meanwhile, preheat oven to 350ºF and line 2 baking sheets with parchment paper. Set aside. 3. In a medium bowl whisk the flour, baking soda and salt together and set aside. 4. When butter has cooled, whisk 1 3/4 cups of the brown sugar and the salt into the butter until the mixture is completely smooth, about 30 seconds. Then whisk in the egg, yolk and vanilla for another 30 seconds. Using a rubber spatula, stir in the flour mixture until no traces of flour are visible. 5. In a shallow bowl, mix the remaining 1/4 cup brown sugar with the granulated sugar. Roll rounded tablespoons of dough into balls and then toss them into the sugar mixture to coat well. Place them on the baking sheets about 2 inches apart. 6. Bake 1 sheet at a time for 12-14 minutes, rotating sheet halfway through the baking, until edges of cookies look set but centers are still soft, puffy and cracked--you really don't want to over bake these or they'll be crunchy instead of chewy. Let cool on the sheet for about 5 minutes and then transfer to wire rack to finish cooling completely. 7. Store in an airtight container for 3-4 days at room temperature. Coated dough balls may be wrapped and frozen for up to one month, bake them frozen on a cookie sheet set inside of another cookie sheet at 325º F for 20-25 minutes. (I've never done them this way because I'm not a freezer person, but it sounds like it would work well. Note: Recipe adapted from The Perfect Cookie by America's Test Kitchen. I made these a little smaller than the original recipe calls for so I got thirty instead of 24 cookies.